Amazon Price: $57.15 (as of April 25, 2019 2:46 am - Details). Product prices and availability are accurate as of the date/time indicated and are subject to change. Any price and availability information displayed on the Amazon site at the time of purchase will apply to the purchase of this product. The Vertex Gotham linen duvet set and accessories is constructed from 100percent linen. 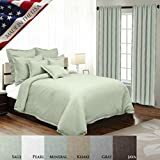 The set is available in seven stunning colors, the set includes two shams and duvet cover which features a hidden flap with a total of four buttons. (Dec pillows and window treatments sold separately). suitable to use as a decorative item. Unique home decor. This product is manufactured in China.